I arrive in Kanab – at last! Kanab is a small town founded in 1870 and situated in the south-western corner of the state of Utah, a few miles from the frontier with Arizona. A typical Western town with a wide main street, wide sidewalks, a dozen or so filling stations and the same number of motels. A stop-over town for visitors to Zion National Park, Bryce Canyon National Park, or Page (Lake Powell). I stop at the corner of E300 S and S100 E at « Big Burgers », where they serve the best hamburgers in the region. While I enjoy my special « Double Big Red Burger », I make a last check of the survey map which will show me the way to White Pocket. After buying all the water I need at «Food Town», the local supermarket, I head East out on the 89 towards my final destination. 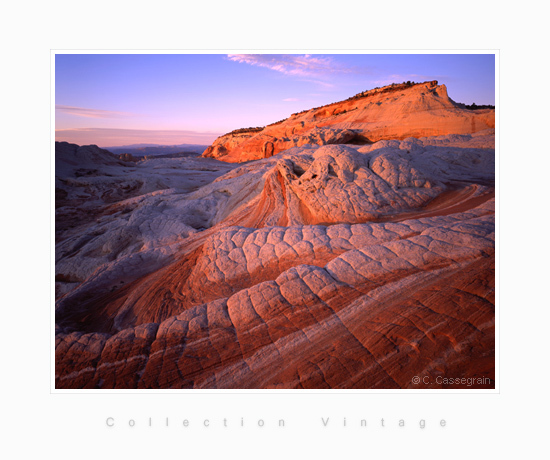 White Pocket is situated in the region of Paria Plateau and the Vermilion Cliffs National Monument, which I've been walking for more than 20 years. 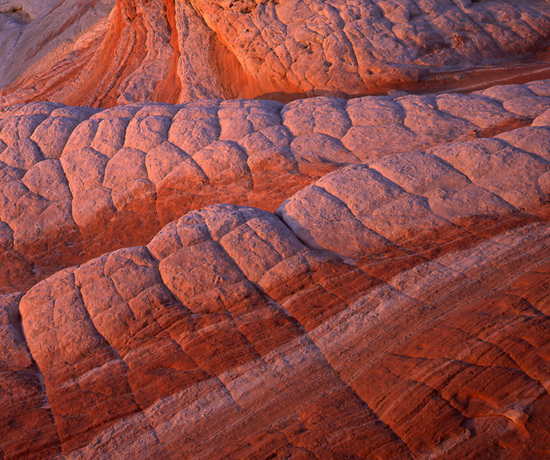 A region rich in multicoloured deserts and steep canyons. It would take more than one lifetime to completely explore this region, which is about 300 square miles wide. 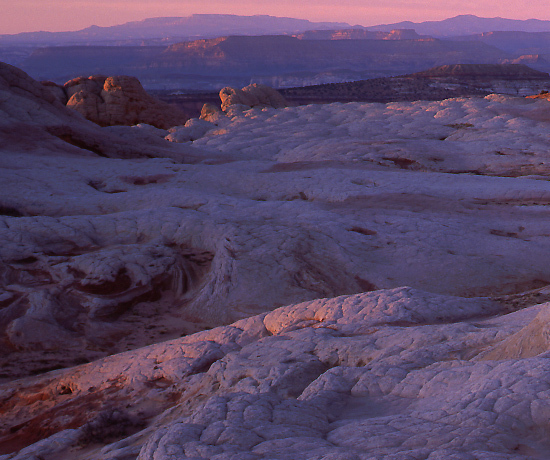 The desert which composes the area is mostly sandstone, in varying degrees of hardness. 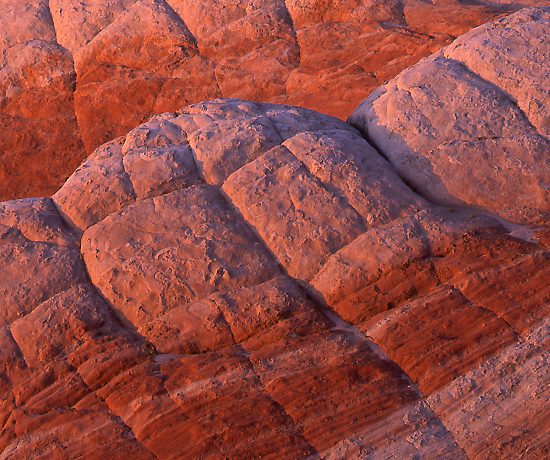 Over the millenia, layers of cementation have formed, rich in iron oxide, which gives the rock its vibrant reds, oranges, and yellows. After close to an hour and a half of driving, I stop the 4x4 at the start of the trail to check that the tires are slightly under-inflated. It hasn't rained for several days, and the sand is soft. After a short rest of a quarter of an hour, and all alone up against this wild stretch of desert, I roll onto the trail and begin the last twenty kilometers which separate me from White Pocket. The region is hostile and full of traps. I take no less than an hour and a half to cover these few kilometres, pausing twice to dig the 4x4 out of the sand with a shovel. But once I arrive, the spectacle is grandiose! It's nearly 4 p.m., which leaves me time – with my hands in my pockets - to explore this extraordinary place. Here wind and water have sculpted true works of art – all the forms and volumes are one. Every square yard is different, and stimulates the imagination. Dromedary's humps, giant seashells, or waves frozen for eternity. Once I've scouted the spot I'll be working from today, I return to the vehicle to prepare the photographic equipment. This particular shot is not an easy one, taking into account my chosen spot immediately above the subject, and it's proximity. After a half an hour of « combat » between me and the different adjustments for tilt and shift of the field camera, the landscape appears at last, clear and precise, on the frosted glass of the field camera. All I need to do now is wait for that perfect moment! At about 6.45 p.m., the light becomes milder, the shadows soften, and a quick check of the light indicates an aperture of f32 for 1 second. It's a privileged moment - I press the trigger to capture this instant when the rock and the light are in harmony. I stand and savour this moment to the full, while dusk creeps in, prelude to the murmur of the night.